How many steps does it take for your employees to send out mail? At first glance, it might seem like a simple, no-nonsense process – everyone’s sent mail before. Why should it be different for an organization to send out parcels, letters, and packages? However, once you get to the point where you are consistently sending mail out to clients, partners, and leads and the overall volume of mail hits a certain threshold, it becomes clear. First, you may notice your mailroom is in a perpetual state of chaos. It doesn’t matter what resources you dedicate to it, there is simply always too much material and not enough time. Second, you might begin to hear about customer or partner complaints. Perhaps a mailroom team member sent an invoice to the wrong address. Maybe another team member misspelled the name of your biggest customer. Whatever the case is, it indicates that you might need to outsource some of your mailroom operations to a company like Donnellon McCarthy Enterprises. The truth is each parcel you send out is the result of a larger number of individual steps than you may realize. 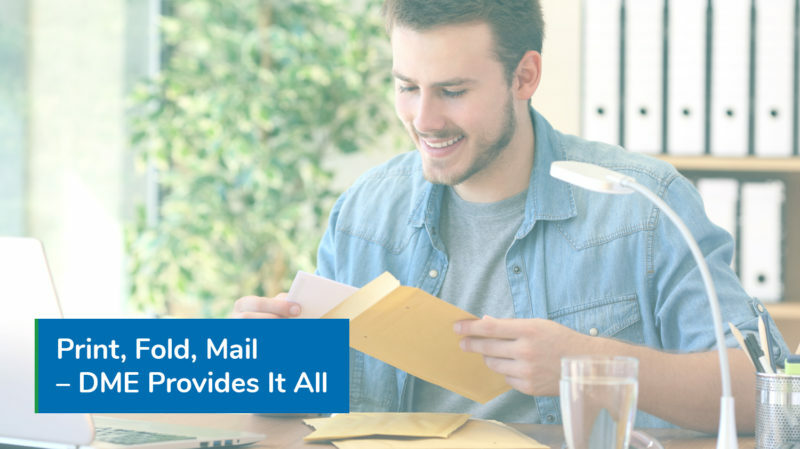 Printing documents, folding them so that they fit in envelopes, applying the correct postage, verifying the address and getting them out of the building are all distinct activities that need to be optimized for efficiency in your mailroom. Our managed mail service accomplishes this. We free up your mailroom resources so that you can focus on the more important business critical processes while we take care of the ever-increasing number of low-value tasks that simply need doing – printing, folding, and mailing. To do this, we use some of the most powerful and sophisticated technology available on the market. As FP Mailing Solutions partners, we offer full access to a broad range of high quality mailroom products, from Wi-Fi-connected postage meters to large-scale printers and folders capable of processing hundreds of letters per minute. These products and solutions allow our customers to generate efficiencies that are otherwise not possible. When you rely on us for postal solutions, you can transform even the most disorganized, chaotic mailroom into a pristine work environment. We are experts in document archival, ensuring that your most important letters are retrievable at any time, from any device you choose. This way, if a customer calls to ask why they haven’t received their package, your employee has immediate access to exactly that information – this saves time, increases customer confidence, and boosts your bottom line. We achieve this feat using the latest in mailroom scanning technology to ensure packages and letters are represented as digital assets on the cloud. Mailroom scanners ensure that every outgoing package is in the system, and you have immediate real-time data on every single one. By now, you should know that implementing workflow efficiencies is the most effective way to transform your mailroom. However, you may not yet be sold on our specific full-service promise. One of the main motives our customers have to choosing us over the competition is the strength of our partnerships. From one-off community events to sustained relief and charity efforts, we do everything we can to improve the community and make it a better place for everyone. This policy is perfectly in-line with our company mission. Our main purpose is simply to help people, and we do our best to achieve that wherever and whenever possible. Taking the most mundane mailroom tasks off your hands is just one of the ways we do that. Hugely improving your day-to-day efficiency in the process is a bonus! Donnellon McCarthy Enterprises offers full service mailing solutions to small businesses, offices, and enterprise-level organizations. Contact us and speak to a specialist to learn more.